HP has just achieved a major milestone: they’ve become the first company to attract 1 million followers on LinkedIn. But these 1 million followers represent much more than a number. They are an invaluable asset to HP. They form a targeted community where HP is communicating with the specific professionals that matter to their business, in real time. 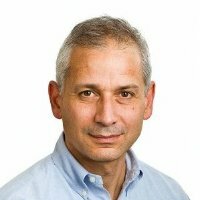 Given that this communication is happening in the professional context of LinkedIn, where professionals are actively seeking insights and information, and where Influencers like HP’s CEO Meg Whitman are directly sharing their expertise, it’s an engagement channel that can’t be replicated elsewhere. Followers Engage: Following a company is an active choice. Not everyone chooses to click the ‘follow’ button. Followers on LinkedIn genuinely want the content HP shares. The industry insights, product information and company updates from HP are not ads. Far from it. This is highly desired content that will help LinkedIn members in their current profession and what they do in the future. Followers Fit the Target: HP’s followers are especially valuable. Their LinkedIn profiles tell us that they are, in fact, exactly the people HP wants to engage: senior-level decision-maker in relevant industries. To further ensure they had the members they sought, HP also used targeted LinkedIn Follow Ads to increase followers by 300k in a two-month period. HP now has a completely opted-in community comprised of exactly the people with whom they wish to develop relationships. Followers Amplify: HP’s followers share the company’s updates with the professionals in their LinkedIn network by liking, commenting, and sharing. HP’s followers are directly connected to over 43 million professionals on LinkedIn, giving HP qualified reach well beyond their follower community. 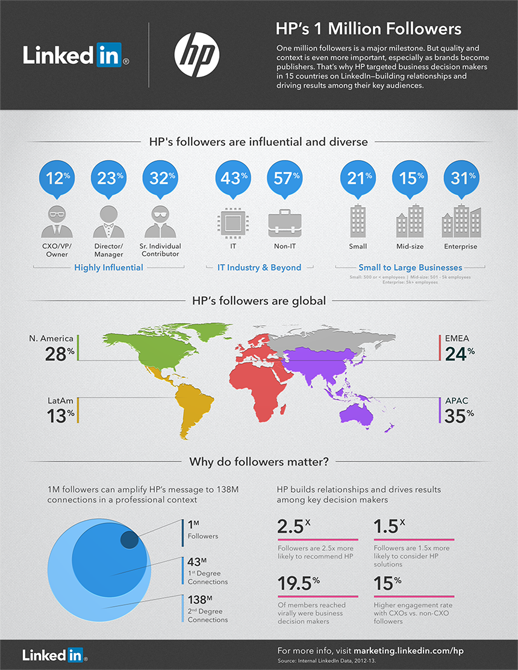 HP’s followers also are advocates – they are 2.5 times more likely to recommend HP than non-followers. And with HP posting multiple updates per day, the amplification opportunities increase exponentially. I encourage you to learn more about how you can send targeted status updates on LinkedIn. With the proliferation of content on social platforms, you need to engage your best prospects and customers with content that’s tailored to their interests. As HP has shown, LinkedIn gives you an opportunity to target professionals and engage them with content that will drive results.